The standard 1/4” feltlike padding included on the bottom of most carpet sets. Additional jute padding is available to provide extra insulation. For use when excessive heat is a problem. This is jute padding with a layer of aluminum laminated to one side which will reflect the heat away from the seating area. A thick 1/4” acoustical foam laminated to a layer of acoustical vinyl. 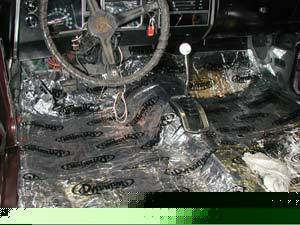 This is superior sound dampening carpet underlayment. To reduce road and engine noise. Thin, self adhesive padding will mold to contoured floor pans. It will help create a quieter interior and provide for better stereo sound.